Hardcover, 10 in. x 10 in. "Jackie was without question the best of his era. As well as being a 'natural' driver, he never stopped thinking about ways of doing things better than other drivers, ways that would mean that he was always the man to beat. When he retired as World Champion at the end of the 1973 season he had been the man to beat in Grand Prix racing for five or six years." Thus was Jackie Stewart praised by his successor in the Tyrrell team and a future World Champion himself, Jody Scheckter. Champion in 1969, 1971 and 1973, Stewart was the first driver since Juan Manuel Fangio to win more than two world titles. His wins-to-starts ratio was always remarkable. Contesting 99 Grands prix he won 27, even pipping the 25 of his idol, fellow Scot Jim Clark. John Young Stewart astonished the world of motor racing with his precocious skill in a Formula 3 Cooper for the Tyrrell team in 1964. He had scarcely started racing when he was besieged by Formula I team owners eager to sign him up. 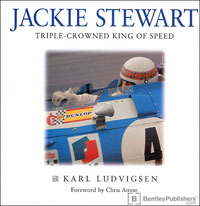 Karl Ludvigsen entertainingly depicts Stewart's career in Lotus, BRM, Matra, March and Tyrrell cars, as well as his Can-Am races in Lolas and Chaparrals, and his cliffhanging near-win in the 1966 Indianapolis 500-mile race. He also chronicles Stewart's long-running campaign for greater safety in motor racing, which met with considerable resistance in a sport in which at that time death was almost routine. This book?in series with Ludvigsen's highly-acclaimed Stirling Moss: Racing with the Maestro?is magnificently illustrated with images from the Ludvigsen Library, including the work of Max Le Grand, Stanley Rosenthall, Graham Gauld, Jesse Alexander, Bernard Cahier and Michael Cooper. Its richly-wrought panorama of more than 200 monochrome and colour images invites the reader into Jackie Stewart's world from the 1960s to the present day. They bring vividly to life the exploits of a great sportsman, with shotgun as well as racing car, who moved on to success as a family man, business executive, and long-term consultant to Ford.